Vote for the MOC you feel best fits the theme of BBC Contest #69: Everything Old is New Again! 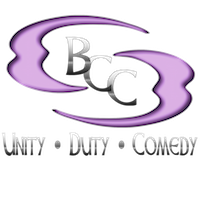 This is it... it's the final round of voting for BBC Contest #69: Everything Old is New Again! Huh, thought with this many entries there might've been a semi-finals round. But you gotta make it hard and force us to choose one from thirteen, didn't ya. Some good ones here. Dume and the Nui-Jaga stand out, but I think I'll be providing my vote to the Rahkshi at #6. Good luck everybody. Some fantastic entries in this contest! Good luck to everyone! Self voted on this one. There are so many great entries! So many beautiful entries here. It's amazing how many unique creations there were of all sizes and complexities. So many of them blew me away when I first looked at them. But sadly, there must be a choice. And I went with Matoro. 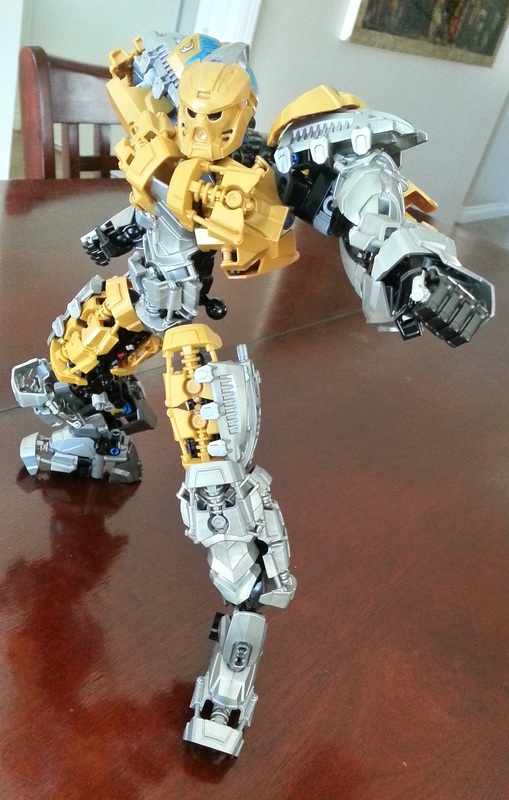 Though not the biggest or most impressive of the bunch, the accuracy to the original set and perfect usage of the available parts is phenomenal. 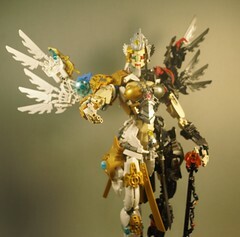 Enough that it beat out the amazing Rahkshi and Nivawk MOCs for me. I voted for #5, as I feel that it's a huge improvement from the official set as well as a more realistic take on it. Sadly, I wasn't able to enter due to time constraints, but I'm grateful to see all of these amazing creations. 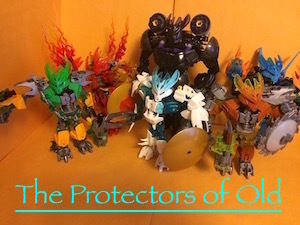 Overall, a great assortment of finalists here, representing quite a few different years of Bionicle. My vote went to Dume and Nivawk, although Matoro and the Nui Jaga are excellent entries as well. I did self-vote for this, but there are so many incredible creations that made it through (some that didn't , but that's what happens in contests). I haven't made a lot of comment/critique on these creations individually, so I'll do that just briefly just now . #1&13: I feel although probably not the strongest in this poll, both convey a very creepy look, and fit the theme well. #5 The biggest of the finalists, and I think the biggest entry in this contest. It's a very impressive MOC, which stays very true to the original set (and movie version). The size and "not-cluttered-ness" are well balanced so its big, and doesn't at all strike me as a cluster of all sorts of parts that don't flow together. The fact it has a function too is also really neat. 6# Some of these Rahkshi look a little awkward next to the others, but my favourite out of these is Kurahk. The use of those Nuju Hordika masks as shoulder pads stand out to me and look really cool. They all fit the theme really well. #7 I don't think this is one of the strongest entries here, however, it looks like a set that I would see on shelves next year. It stays very true to the original Umbra while not looking out of place with the CCBS. 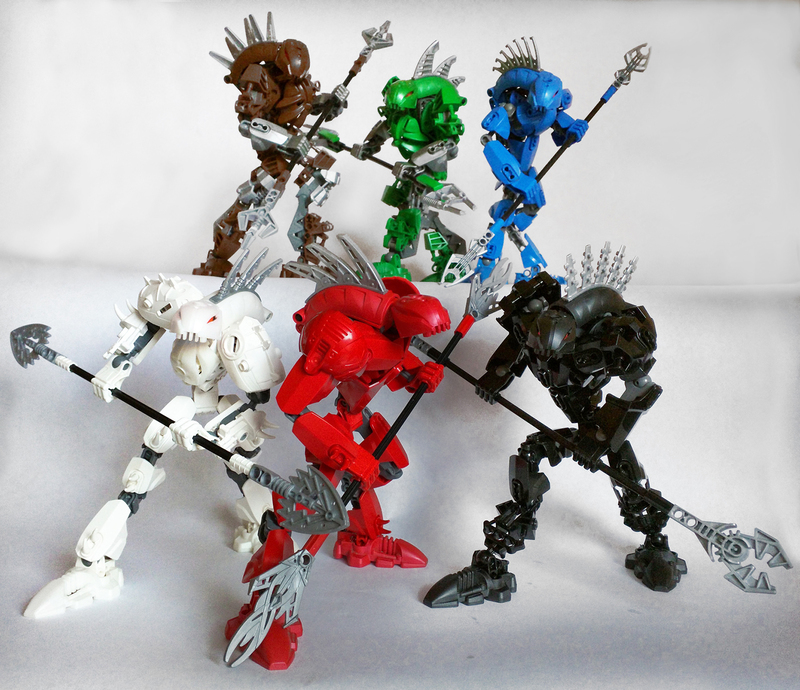 I do think the Bionicle elements used as armour "on top" bring it down a little though, as they have a different aesthetic than the modern look. 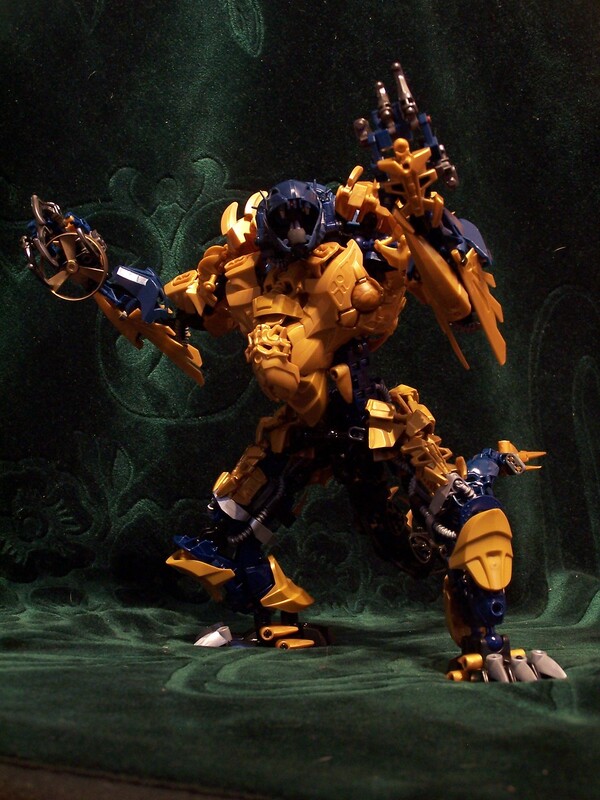 #10 Mata Nui is pretty solid, and is definitely impressive. Although it's a re-imagining, and the colours aren't 100% accurate like with #2, I still like the colour distribution a lot. 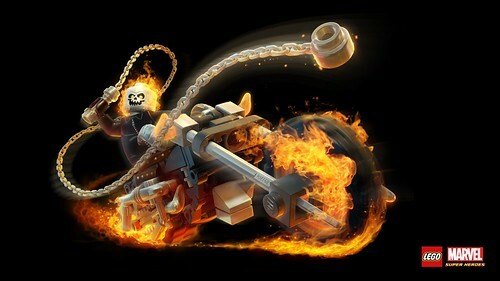 It utilises the new Bionicle elements very effectively and I like the "cuff" look on the arms. #11 is really neat, I know a lot of people are a fan of this one, and I do understand the appeal. 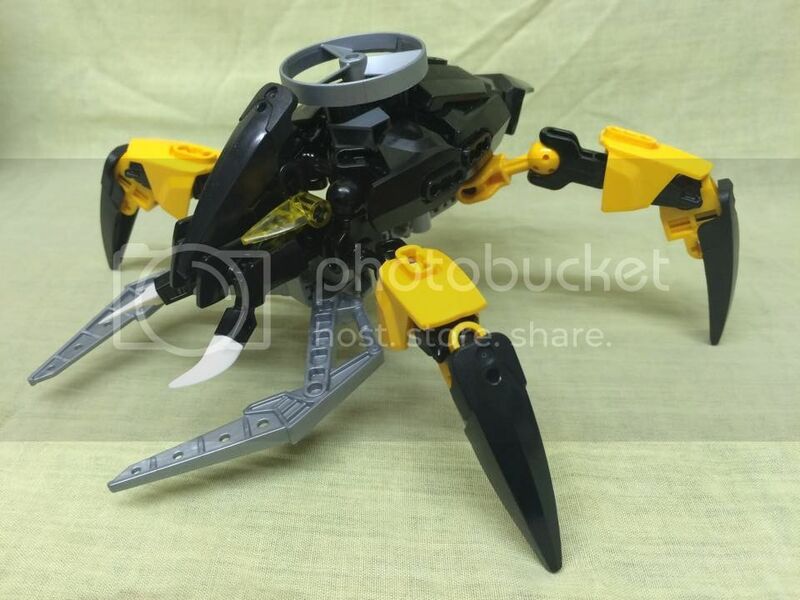 The stinger looks really neat, and just the shape of the model is really neat. I like this one quite a bit, though I think it seems a little too different from the original Rahi. #12 I like this one a lot, I can point out almost no faults at all with this one, and the fact it's a larger model adds to how impressive it is. I particularly like the shaping of the head and shoulder area, which is kinda samurai-esc. This is a really strong finalist and I think think the only let down would be the how gappy some parts are (like the shoulders and upper legs). I hope that this post was not too long... Best of luck to all 12 other finalists!!! Yep, I'm not on the Final poll.... Oh well. I voted for 10. 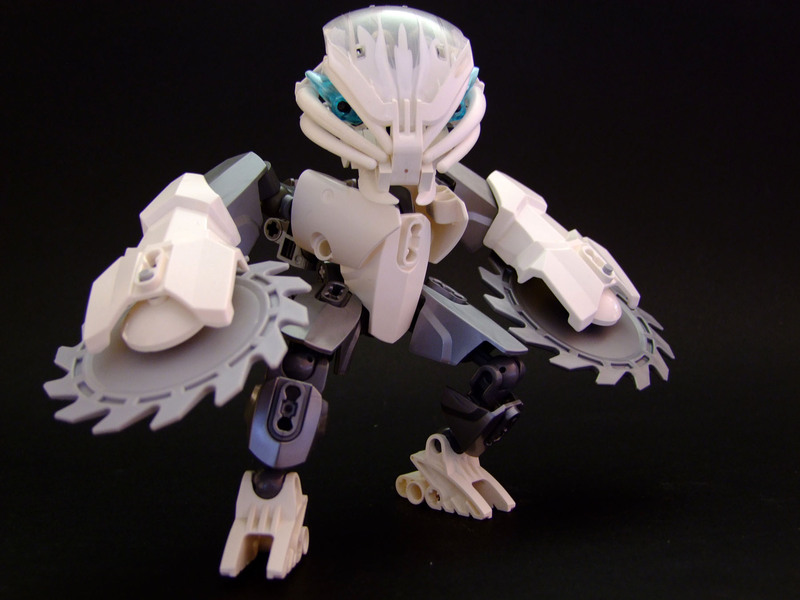 That Mata Nui is simply beautiful, with excellent use of new Bionicle parts. Really struggling between Matoro and Dume & Nivawk, but I ultimately voted for the latter because it takes a set I didn't much care for and made it absolutely stunning, whereas I already really liked Matoro Mahri. It's between #3, #10, and #11 for me. EDIT: Nah, never mind. #10 it is. Great work all around, though: tons of awesome entries! Edited by Chro, Mar 22 2015 - 10:51 AM. Went with the Rahkshi for this one. Good luck! Picked #8. The head just looks so killer. There were a lot of really great MOCs in this competition, especially these. I went with Protector Dume and Nivawk, because everything about that MOC seems to flow together and just work out perfectly. Dume even has a gear function! Best of luck to the creators of the finalist entries! All of these are great builds! I'd point out favorites, but I can't really do that now for obvious reasons. Edited by Tesseract, Mar 22 2015 - 11:45 AM. Aww, we don't get semi-final polls? This competition had a lot of really great entries, and I was hoping that would have brought an epic fight to the death to reach the final. My personal favorites here are #5, #6, #8 and #9. A hard choice, but I went with those Rahkshi. 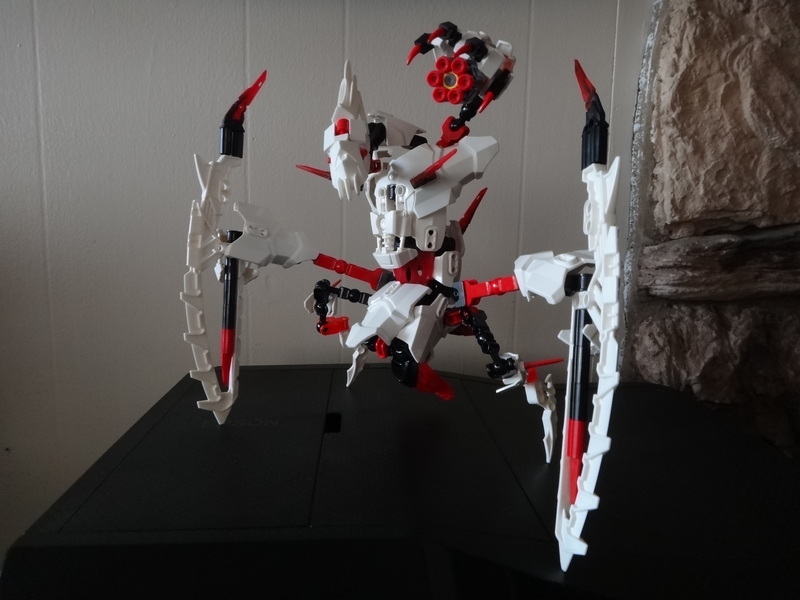 Check out my Bionicle store on Bricklink here! Let me know if you can help me find these last few collectibles! Also looking for WILD KRAATA and a VMKK Yo!!! Wow, yeah... pretty hard choice here without some semifinals to whittle it down a bit. Really tried to keep the theme in mind when doing my own narrowing. These are all undeniably great MOCs, so it still wasn't that easy heh. I think... I'm going with Dume & Nivawk this time. I really would have liked to vote for Matoro, Nui-Jaga, and The Shadowed One as well. They all just look so good. Bit disappointing not to see Hafu in here, but I threw in a vote nonetheless. Good luck to all the finalists! 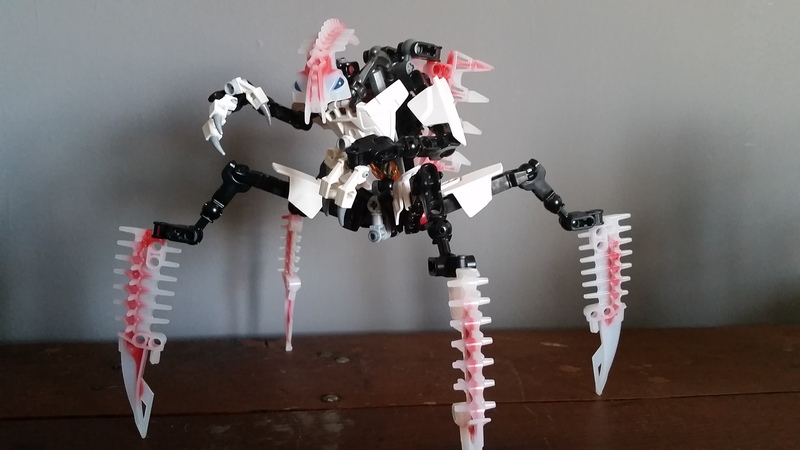 Voted for matoro, because I think it does the best job of looking just like the original set, while using none of the original designs of it, and just being an overall good moc. 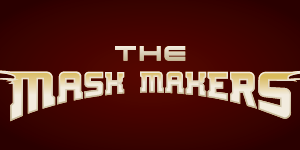 There's a lot of good entries here, but I felt it was the most appealing as a revamp. There's no "No Homers Allowed" rule in BBC contests. Support in the previous round, not an arbitrary limit on how many of a specific subject the contest can bear, dictates what the next round looks like. To me, the best entries in this poll were Dume & Nivawk and the Nui-Jaga. I picked the Nui-Jaga in the end. Not only is it a beautiful model, it's the kind of model I'd love to actually own! 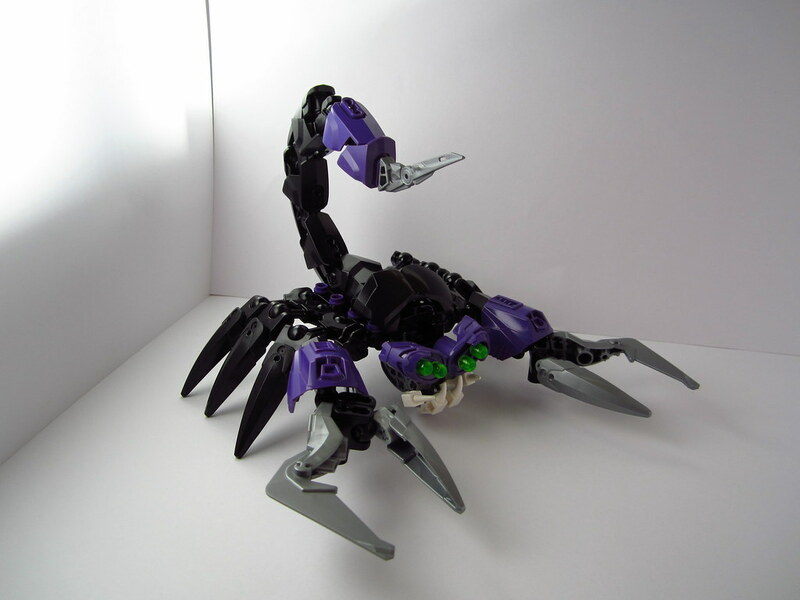 It does a fabulous job balancing the classic look of the Nui-Jaga and the look of a real scorpion, all without relying on G1 BIONICLE parts. 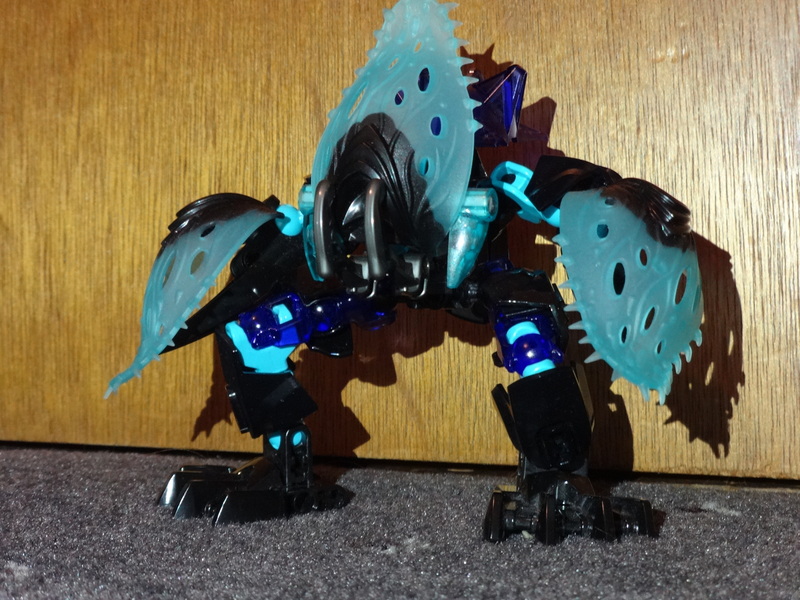 I do wish it had a stinging function, since the return of functional play is one of the hallmarks of G2 BIONICLE, but it's a fantastic design even without one. Really tough choice here. My entry is here, but it's prolly the most mediocre option here, so definitely not even going to bother. 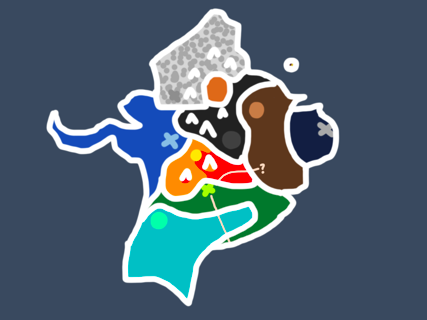 It was between Dume and Nivawk, Ohnorahk, the Nui-Jaga, and Matoro. I ended up going for Matoro, much as it pained me to have to make the choice. Whichever one wins, however, will definitely deserve it! Lost the preliminary poll, but 39 votes is still a pretty good turnout! It's like meeting a unicorn only to have him stab you in the heart with his horn. You make it to the final polls only to have your hopes and dreams utterly shattered! Seriously, the amount of outstanding entries out here is just phenomenal, and I can't wait to see who wins. Matoro looks so much like the original while still looking new; it's a clear choice for me. Even using the new armor bit in lieu of the old Toa foot? Dude. Ultimately voted for Matoro, but it was painful turning down Dume & Nivawk and TSO. Matoro just looks so much like the original set while at the same time keeping with the aesthetic of G2. Best of luck to all the finalists! Edited by Cyrix, Mar 22 2015 - 07:20 PM. Incredible creations. Really loved this contest. Went with #11, Nui-Jaga. Real smooth build, and reminds me of VNOLG, which brings happy memories. I'm not surprised that mine did not make it to the finals. 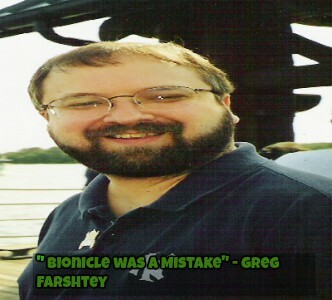 I voted for The Rahkshi since they have great designs, and would do good in the new series. I can see the poll results, and I think I'm not supposed to since I voted..? Edited by shadow_bunny13 (iBunny), Mar 22 2015 - 09:11 PM. *bursts into tears* why must I choose!? 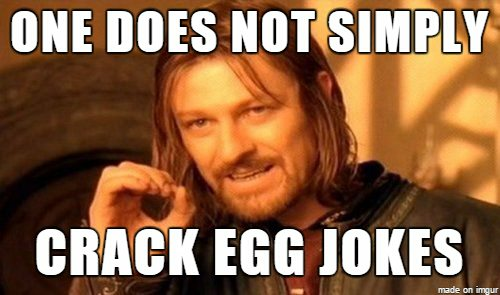 Matoro, Dume & Nivawk, and the Nui-Jaga were all so awesome. Had to go for Dume & Nivawk though. If that was a G2 set, I'd be camping out to buy it. Edited by Space: Ocean of Awe, Mar 22 2015 - 09:12 PM. A lot of good entries but I had to go with the Nui-Jaga.